In my early years of learning about data compression, the book Text Compression by Timothy Bell, John Cleary, and Ian Witten was my resource of first resort. I was in Christchurch, New Zealand, recently and had a chance to meet Tim for the first time in person. Tim teaches at the University of Canterbury in Christchurch, and is Deputy Head of the Computer Science and Software Engineering department. I got a chance to ask him about his work in data compression as well as one of his new areas of interest, Computer Science education. MN: Tim, it seems like there has been a lot of interest in data compression in the Antipodes. Names that come to mind include you, John Cleary, and Peter Fenwick in New Zealand, and Ross Williams in Australia. Is this just coincidence, or is compression in the air down there? TB: I’ve sometimes wondered about this myself… during the early days of computing and especially personal computers, it took some time for the latest technology to reach us “down under”, so perhaps we were motivated to get more out of what we had rather than wait some months for a larger disk or new memory to arrive from overseas. When the Internet arrived we started with a very small pipe, so a good compression algorithm could do the equivalent to laying a second cable from NZ to the US — who can resist getting something for free? MN: Since you wrote Text Compression back in the early 90s, I’d say the biggest development in lossless compression has been the Burrows-Wheeler transform. Is lossless text compression basically done? Are we left with just incremental improvements as processor resources increase? MN: It looks like you are now dedicating a large amount of your time to establishing computer science as part of the basic curriculum in high school education, for students in the 15-18 age range. In many ways, this is as much a bureaucratic problem as an academic one. What motivated you to take it on? TB: It’s been a problem that we’ve complained about for decades, and it’s been getting worse and worse as computing in schools has focussed increasingly on using computers and not preparing students to be developers. A lot of this can be attributed to bureaucracy — it’s hard to explain to government officials that putting word processors in every classroom isn’t the same as building a computationally literate society. As a result of some strategic lobbying done by others, a small window of opportunity opened for me to be on a group to advise our Ministry of Education, just over 3 years ago. The group managed to convince the officials that something useful could be done, and then we had to work very quickly to come up with a concrete proposal before the enthusiasm died down. This has happened rapidly; the advisory group first met in November 2008, and Computer Science started being taught in schools in February 2011. MN: What have you been able to accomplish in New Zealand so far? TB: Computer science (including programming, but also topics the involve understanding the importance of things like algorithms, HCI, programming languages and even compression) is currently available as part of computing courses for two of the three final years of our main high school graduation qualification, with all three years being covered from 2013. After that we would expect some of the introductory material to start filtering down to earlier classes, and for wider offerings as teachers become more confident in the subject. One of the biggest challenges has been preparing teachers, few of whom have significant experience in Computer Science. Many have embraced it enthusiastically, and the universities and others have done a lot of work to help them get up to speed. It’s been a wild ride doing it so quickly , but there have been some very pleasing outcomes. MN: And how do things look in the rest of the world? Are there any obvious winners and losers at this point? Do you have any concise advice for the world? TB: Computing in schools is a hot topic around the world; the UK have just announced a strong drive to introduce this sort of material to schools, and the US has people working hard to make it available to students. Israel and Korea have had computer science in schools for some time. We’re learning a lot about what is worth teaching, and what the best pedagogy is for the general classroom (most of our experience is for specialist students who have chosen the subject!) 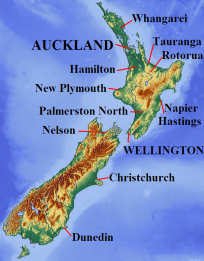 The New Zealand path of getting something going quickly with grass-roots support seems to be more effective than waiting for a top-down approach which could take years to develop and prepare teachers for, although it does make for a bumpy ride as problems are ironed out as we go along! MN: This might be straying out of your area a bit, but do you see CS in a K-12 education setting having an effect on the representation of women in the STEM fields? TB: Attitudes that affect representation definitely start at school, and to me the biggest goal of teaching CS in high school is not so much to prepare students for further study, but to enable them to find out what the subject is! School students rarely know what CS is, and even worse, it’s common for them to assume that it must be advanced word processing or some other dull area, and hence they avoid it. It’s particularly important for female students to have the opportunity to find out if it’s something that they might be good at, as the stereotypes associated with computing can make them assume that they shouldn’t consider it as a career. MN: One final question, Tim. The whole world has seen the devastating damage Christchurch has suffered from the earthquakes in the last year. How has the University of Canterbury held up? Have you managed to maintain continuity in your academic calendar? TB: It’s been quite a year! Thankfully our university has escaped the brunt of the earthquakes (most of the damage is some distance from the university), and we’ve managed to keep a full programme going despite being closed for three weeks for safety checks. Many students joined the “student volunteer army”, who helped with the cleanup in the damaged parts of town, and that was probably one of the most valuable experiences of their career! It hasn’t been without disruption as buildings need to be checked carefully, and some are still under repair, but with a bit of resourcefulness we managed to keep going (for a while I even delivered my classes in a restaurant while lecture theatres were being inspected) The city is now going through a massive program of redevelopment with some pretty creative ideas, and it’s an exciting time to be part of these changes. Thanks to Dr. Bell for taking the time to share all this with us. My visit to his amazing homeland was a real treat, and the short time I got to spend with Tim in Christchurch was worth the trip all in itself.